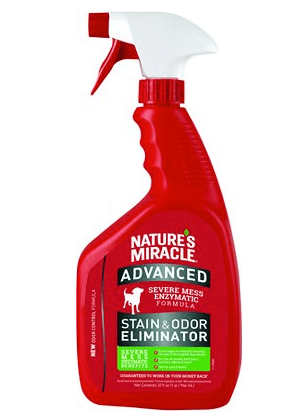 Nature’s Miracle Advanced Severe Mess is an enzymatic stain and odor eliminator. Enzymatic formulas are used to digest organic matter which in turn destroys odor and prevents re-soiling. This product targets canine urine, diarrhea, vomit and blood, however, it works great on the feline variety of all those messes as well. I had tried other stain and odor removers from Nature’s Miracle that didn’t work well. When I first sprayed Nature’s Miracle Advanced Severe Mess I had to leave the room because of the smell. Although a pleasant smell, I reacted to it and started coughing a lot. I am sure this is not typical, since I happen to be very sensitive to smells in general. I am glad to say that just by leaving the room for a couple of minutes, I not only stopped coughing but was able to return with no further issues. This is a very good thing since I absolutely love this product! I have used this on new problem areas as well as old problem areas. My technique has varied to confirm its usefulness. First I tried dabbing up all moisture, then cleaned with water and then applied Nature’s Miracle Advanced Severe Mess. Next I applied it right after dabbing up moisture. Then I tried dabbing, followed by using another cleaning product and then applied the spray. In all cases the results were excellent. My son spilled some coffee with milk in his car so I gave him the bottle. It worked on that too! Unfortunately he never gave it back to me. 🙁 I miss it so and now consider it a must have in my cleaning arsenal. I am ordering another bottle today. If you need more proof just Google it. This product rates a consistent 4-4.5 stars at many large suppliers. I received this product for free from Chewy.com in exchange for an honest review. This is my honest review and do highly recommend this product. If you have used this product, or decide to try it, please comment below with your experiences. The pleasant smell is quite strong at first.